This is a quilt I made as a housewarming gift a while ago for my cute friend Beth. We met when I was a missionary in Texas and quickly became good friends. She and I can talk for hours and hours about anything and everything, even if we haven't talked in a really long time! 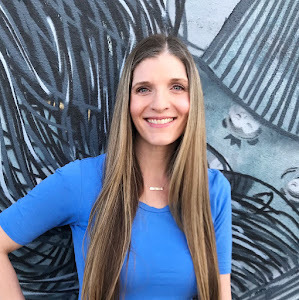 Beth is 20 years older than me --almost to the day (our birthdays are 1 day apart) but you would think our ages were reversed...she runs and hikes and bikes and skydives --and does a lot of other really cool stuff I wish I had the energy (and/or guts) to do! She's a mom to 4 boys and is one of the nicest, most generous people I know! She is an amazing woman! I used the pattern "Bear Country" by Debbie Field, (with a few modifications of course...I can't seem to follow a quilt pattern without changing it a little). 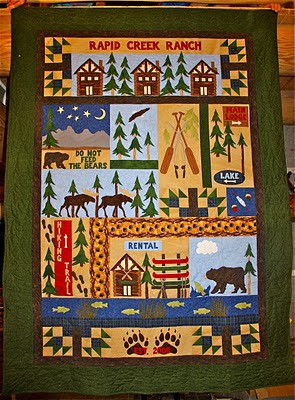 I had a chance to visit the area where Beth was moving, and it is so pretty and peaceful-- so when I saw this quilt pattern, I loved that it had all the pictures of log cabins and bears and fish and elk and all the stuff that reminded me of Idaho. I added the night scene with the mountains--Beth's house is really close to the Tetons, so the mountains are supposed to look like the Tetons, although I must admit, they were harder to make in fabric than I thought they'd be! 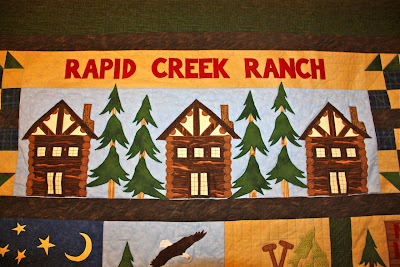 Luckily it took them a little while to build the house, because it took me a long time to get the quilt finished! I found most of the fabrics for the quilt at a local quilt shop, and I made most of the quilt pretty quickly but then got stuck when I couldn't find the fabric with the little bear paws on it--or anything to replace it. So a few months later I happened to be at Quilt Market, and I ran into Debbie Field (the pattern designer), and told her of my dilemma and she gave me the phone number to a fabric shop that carried the fabric (score!). So I was finally able to finish the top. Well then I had a baby and moved across the country and it took me another year to get it out of a box and get it quilted! This was a really fun quilt to quilt! I free-handed everything, going around all the applique shapes, and then making clouds, trees, grass, bear paws, etc. for the backgrounds and borders. 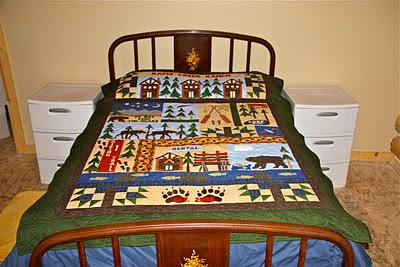 Here's the quilt on her guest bed...makes me wish I had thought to make it bigger! Enjoy the rest of the Festival!! Cynthia! You made me cry and miss you more than I already do. Are we really 20 years apart? That's insane, I don't feel old enough to be your mother. lol I view you as a near same age friend. I remember when you came to visit me in Idaho after your mission and how we stayed up all night talking just like teenage girls at a slumber party! lol You're the best!!! I loved the story of how you made the quilt and the work it took. Made me cherish it even more! Don't worry about the size. After my guests have seen it I take it off so it doesn't end up on the floor or get something spilled on it. It would be awful for something to happen to it! Also, the color you chose was perfect. 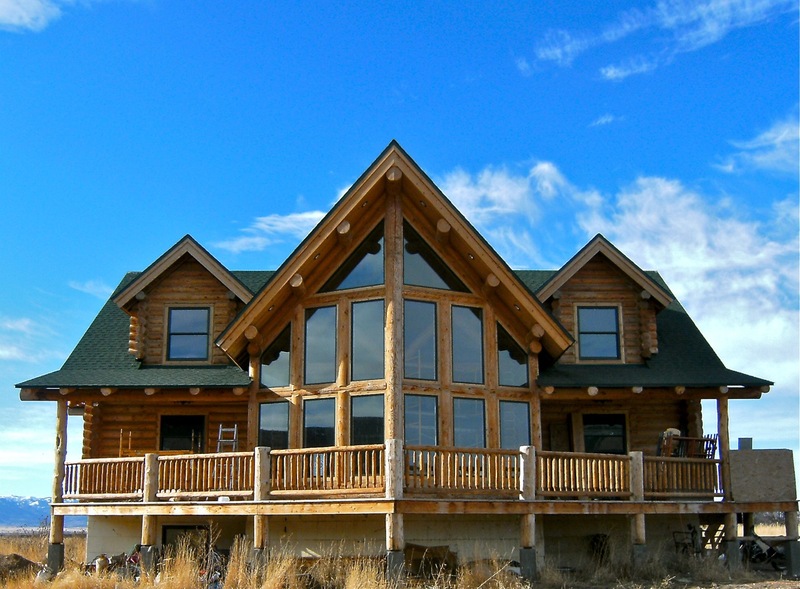 I have a green roof, doors, window panes, etc. Wow Cynthia the quilt looks amazing! And it looks like Beth loves it too. 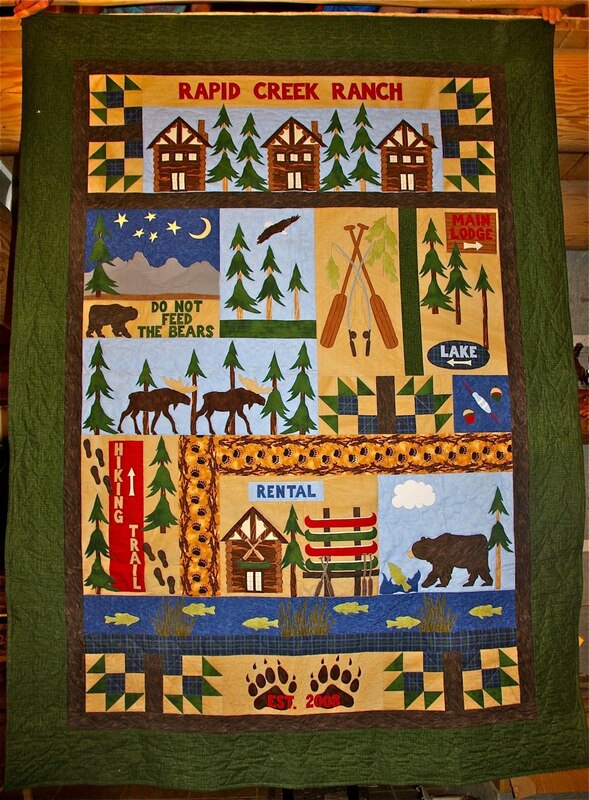 What a beautiful quilt and story of friendship! Wonderful quilt! I can't believe the creativity of some of you applique folks! I have been talking myself out of trying hand applique...someday. 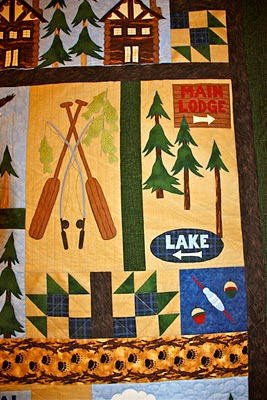 What a cute quilt -- Beth is very lucky! Maybe you can give me some pointers on how, exactly, you find time to quilt with a new baby and a toddler running around? 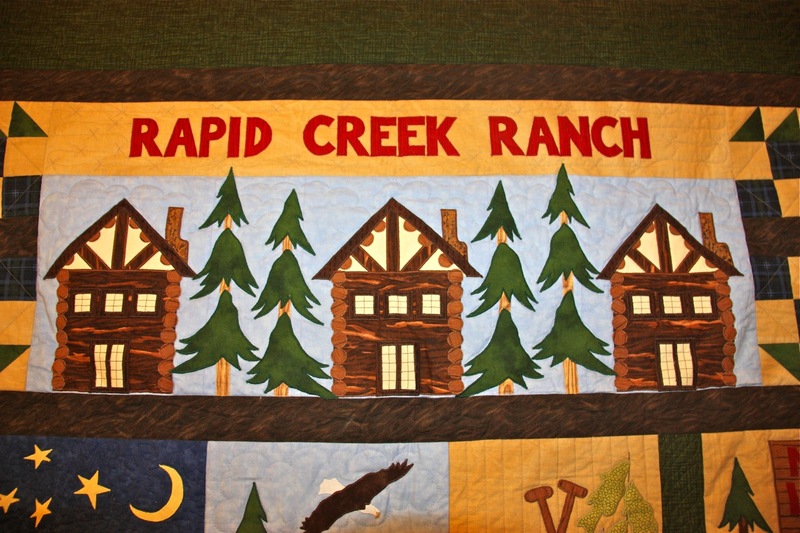 ;) Your quilts rock! 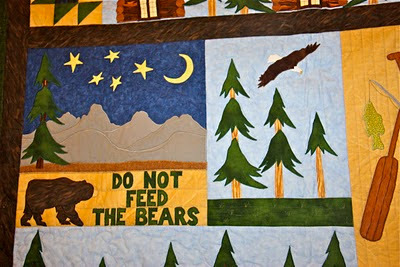 I love your quilt and its story. The log cabins really caught my attention -- they are wonderful. I'm going to presume that your mission was for the Church of Jesus Christ of Latter-Day Saints. If so, we share the same wonderful religion. We also share the same ideas about quilting -- not ever following a pattern to exactness. P.S. Thanks for your comment on my Halloween quilt. What an amazing gift! It is a beautiful quilt. I love how detailed it is. You did a beautiful job. Thanks so much for sharing! Fantastic personalised quilt. Awesome gift. 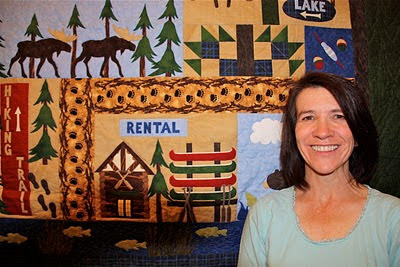 Great story and great quilt Cynthia! I see by Beth's comment how much she likes the quilt! 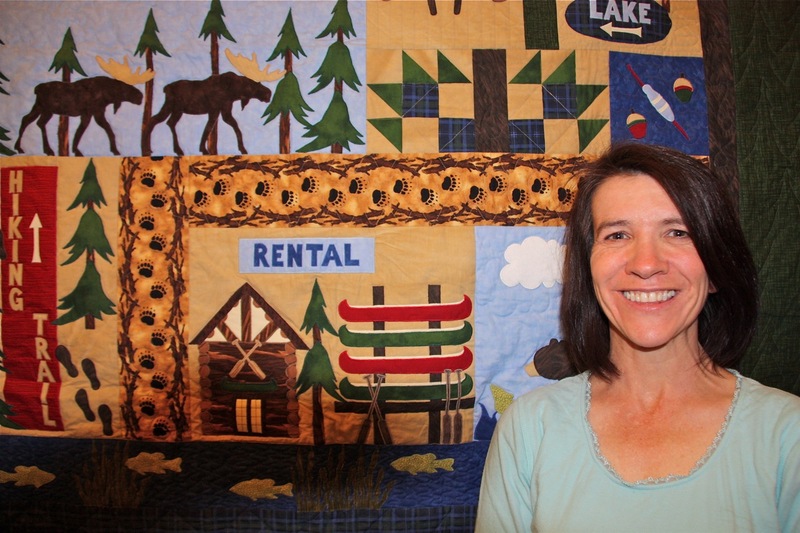 This is such a wonderful story behind your quilt. It looks great and is a lovely gift for a special friend. Thanks for sharing your lovely story behind this special quilt and so beautifully told. Beth sounds like an amazing woman and friend. 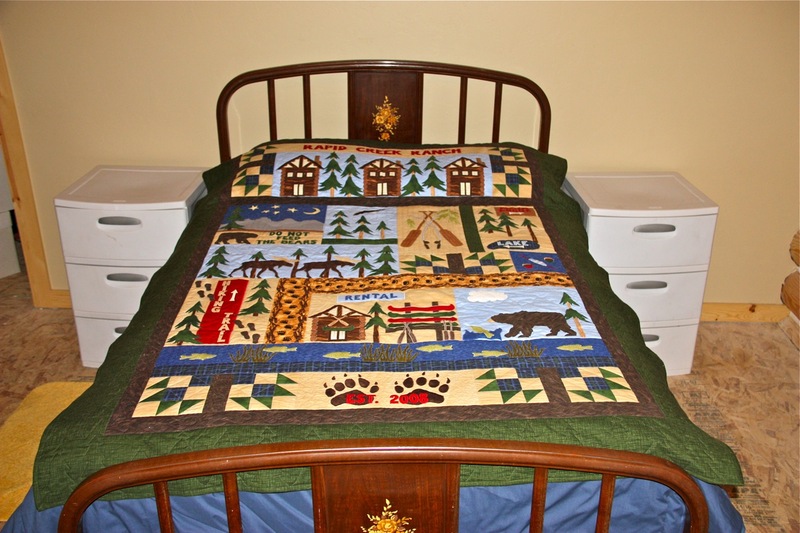 The quilt is beautifully made and looks perfect for the style of her house. Is it handquilted or machine? 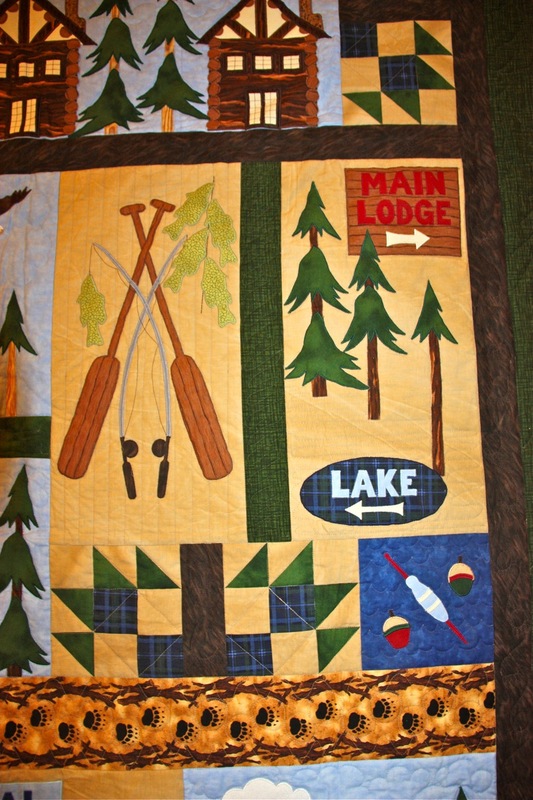 This is such a special quilt and such a lovely story of friendship!